The school is an 11-18 sports college situated in the West Midlands, United Kingdom. Due to its outstanding results, The Streetly Academy found its way into the top 8% of all schools on a national level. To mark its achievement of Academy status along with its students’ excellent results, the school decided to use a high impact visual communication tool that will allow it to communicate news and information quickly and reinforce its image of an innovative institution. Chamber TV installed a LCD tilling video wall controlled by digitalsignage.NET in the main reception area that offers up-to-date, dynamic information to students, staff and visitors. 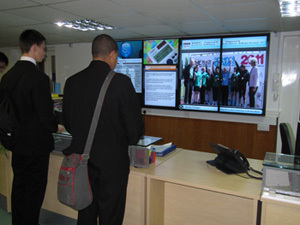 A LCD tilling video wall controlled by digitalsignage.NET was installed in the main reception area that offers up-to-date, dynamic information to staff, students and visitors alike.